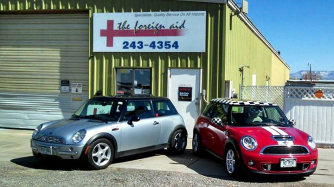 The Foreign Aid offers full scheduled maintenance per factory recommendations, but please keep in mind that for the longevity of your vehicle we have found that some of the factory recommended intervals are entirely too long, for instance “lifetime fluids” such as transmission fluid and coolant still need to be replaced periodically due to contamination. We take the time to check all vital systems and give you an accurate assessment of the condition of your vehicle so that you can make an informed decision about the repairs needed. We can perform all factory-scheduled services and repairs while maintaining your warranty, and most services and repairs are completed in one to two business days. We also offer a full line of tires to suit your every need from Z rated performance to the latest snow tires. Please contact us with any questions you may have.